Caution: I did this eight days ago. I didn’t bake anything this (three-day) weekend, so there was less pressure to get it written up than usual (I try to avoid queuing multiple recipes) because I was planning on doing a 65-mile bike ride today (which didn’t happen for reasons I won’t explain here). In any event, that means that I’m less than usually familiar with the process of baking this cake, and in any event, it wasn’t particularly good anyway. 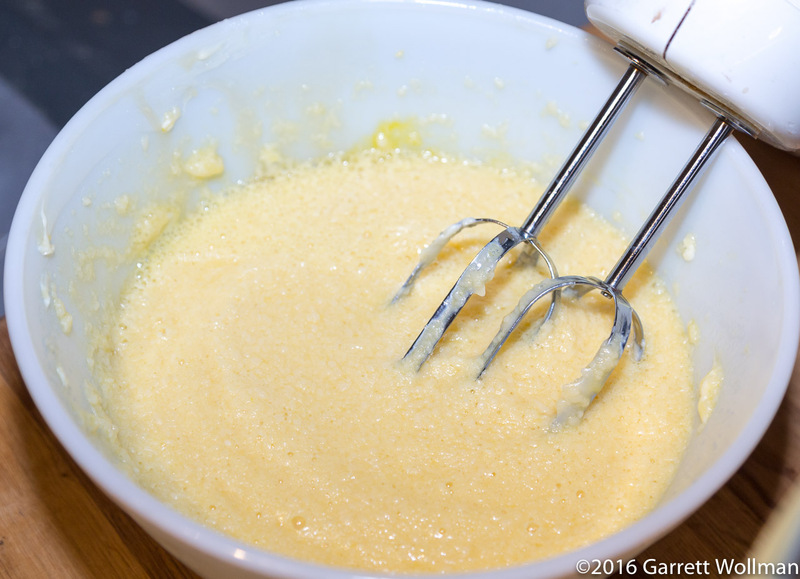 I’ll be out of town next weekend, so there will be a substantial gap before the next recipe post. Clockwise from bottom left: four eggs; two ounces (55 g) of sour cream; 5 oz (140 g) of whole-wheat flour and 3⅛ oz (90 g) of all-purpose flour (in the same bowl); 1½ sticks (170 g) of unsalted butter; 12 oz (340 g) of honey; 3 oz (85 g) of sliced almonds; and finally, ½ tsp each of salt and baking soda (in the same bowl). The recipe proceeds by beating together the wet ingredients — you can’t really call it creaming here, because the honey doesn’t have big crystals to punch holes in butterfat the way actual sugar does. 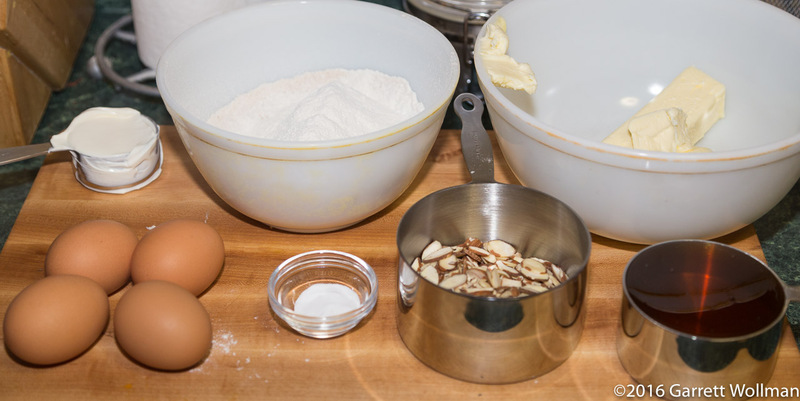 The dry ingredients (such as they are) are mixed in the usual way and then stirred in, and the sour cream and ¼ cup of the almonds are stirred in to finish the batter. 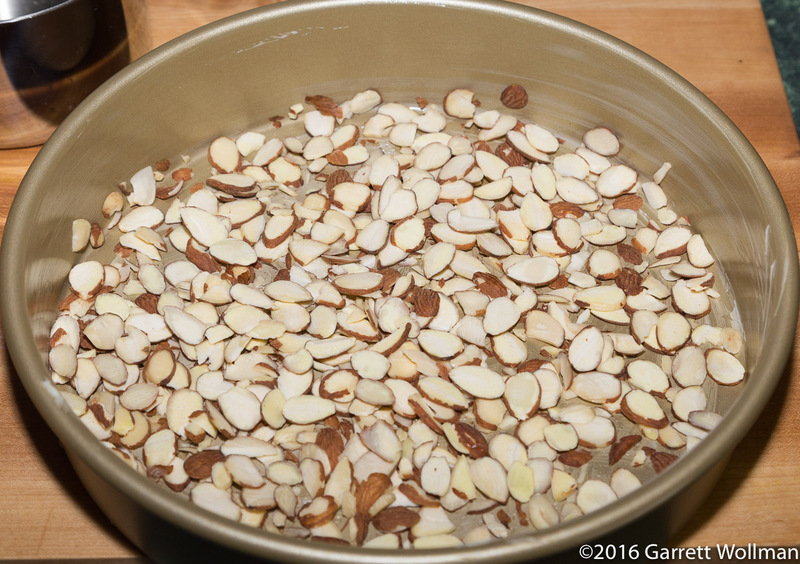 Most of the almonds go into the bottom of the prepared nine-inch (225 mm) cake pan; the batter is poured on top of the almonds, which will form the top of the cake when it’s inverted after baking. This cake is baked in a fairly low oven, 325°F (160°C), for about 50 minutes. After cooling on a wire rack for 15 minutes or so, the cake can be inverted onto a serving platter (or a cake stand as I did) and allowed to cool the rest of the way. You can see that some of the batter made its way underneath the almond layer on the bottom, so good pan preparation is essential. 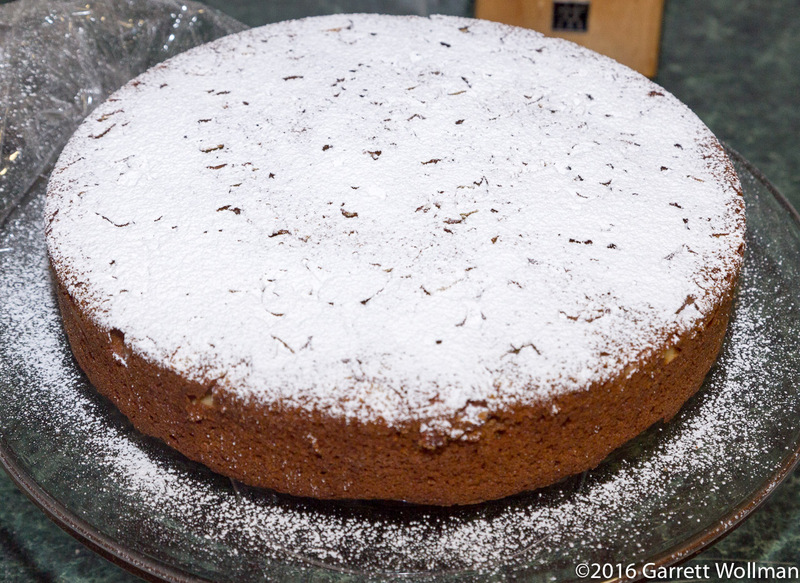 After letting the cake cool completely, you can (if you want) sift powdered sugar on top before serving. To serve, I sliced the cake into 16 wedges in the usual way, but I didn’t do that at home, so I have no pictures. I found the cake to be entirely too dry and lacking in any noticeable flavor; even the almonds were subdued, crunchy but not flavorful. I can think of any number of possible improvements: a more strongly flavored honey (raw, rather than hot-filtered) would be one obvious change, but the recipe didn’t suggest any particular type of honey, and I was loath to try a more flavorful (but super-expensive) varietal. (The honey I used was McLure’s orange blossom honey, which for some reason is now cheaper than the clover honey of my youth.) One could also imagine adding fruit, spices, flavorings, or citrus peel, all of which would have given it some sort of interest that was lacking. First and foremost, I think an unsaturated fat, rather than butter, would have given a much moister mouth feel — but then you’re back at something more like Rosetta Costantino’s Ciambella all’Arancia, which was very well received. 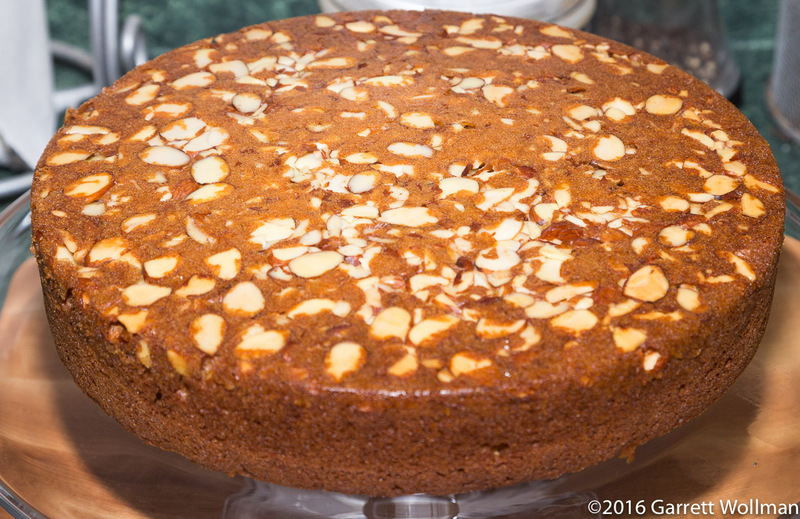 This entry was posted in Food and tagged cake, honey, King Arthur Flour, recipe, whole wheat. Bookmark the permalink.